Regular Season: 10 a.m. to 5 p.m.
Summer Season (June 15 through August 15): 10 a.m. to 6 p.m. Regular Season: Monday through Saturday from 9 a.m. to 5 p.m. and Sunday from 1 to 5 p.m.
Summer Season (June 15 through August 15): Monday through Saturday from 9 a.m. to 6 p.m. and Sunday from 1 to 6 p.m. Regular Season: Daily from 9 a.m. to 5 p.m.
Summer Season (June 15 through August 15): Daily from 9 a.m. to 6 p.m. Parking: Free parking is available in the visitor parking lot located on John Wesley Dobbs Avenue between Jackson Street and Boulevard. MARTA: Take the Blue or Green Line to the King Memorial station. Exit the station and head north on Grant/Hilliard Street for about five blocks. 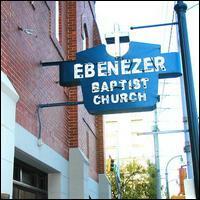 Turn right on Auburn Avenue, and the historic sites will be ahead.